As the summer months drift away and we settle into our cozy sweaters and pumpkin spiced treats, I cannot help but look ahead to what is coming next—The Holidays! No matter which ones you celebrate, the season of giving will be upon us before we know it. Growing up, my family always appreciated homemade, one-of-a-kind gifts. Or, at least that is what they told me. Now that I am older, I still typically only give handmade products; just now they are made by someone else’s hands. You may be like me and may have lost that creative spark, but luckily there are so many talented artisans and DIYers in the Triangle to pick up our slack. Where oh where might I find these wizards of the crafting world, you might ask? GOOD NEWS! 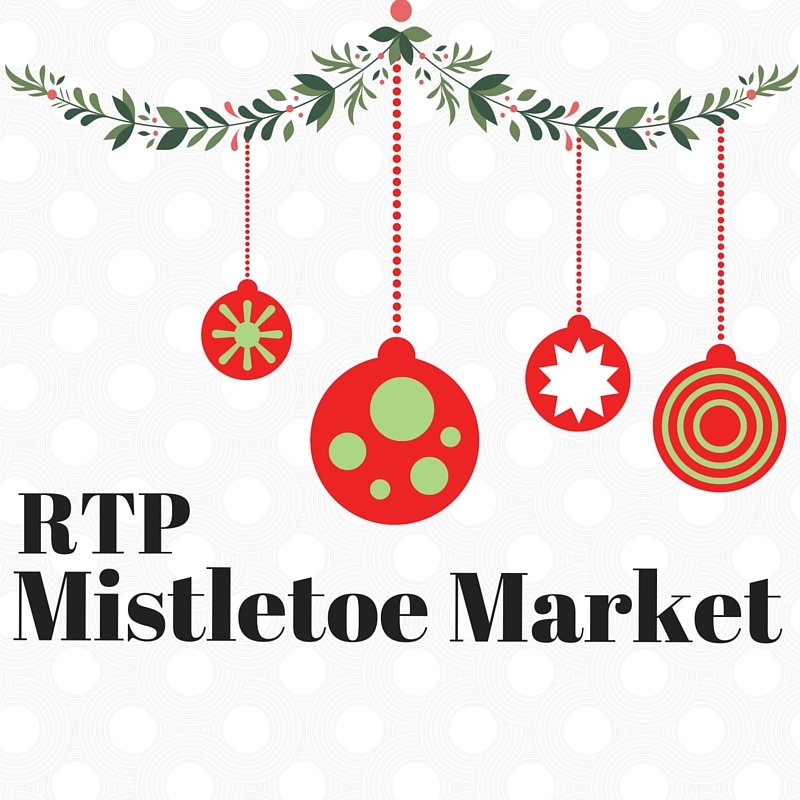 On December 14th from 4pm-7pm during our *extended* Thursday Happy Hour, we will be gathering vendors from all over to sell their goods to you at a little event called the Mistletoe Market. It is the season of giving, afterall, and we at The Frontier want to do our part. In lieu of taking any sort of booth or application fee from our vendors, we have asked them to donate 15% of their proceeds to the Travis Manion Foundation. Over the course of the next few weeks leading up to our event, I will be sharing tidbits from some of our vendors about who they are and what you can expect from them on December 14th. Mark your calendar; we all look forward to seeing you one 12/14/17! A: I wanted to learn to sew and started with pillowcases and cloth napkins but quickly learned I liked sewing for dogs better. Everyone is happy when they buy their dog a bandana – I am happy because it’s growing my business, the owner is happy because their pup looks cute, and the pup is happy because of all the extra attention they get! Q: Should we plan to see you on Shark Tank one day? A: I will watch Shark Tank, but don’t expect to see me on there – one of the things I love about my business is the handmade nature of it. A: Wow – thinking about goals for 2018! I would say watch for Sassy Bliss to hit 3,500 sales on Etsy, grow my Instagram following, and work with more rescue organizations. Q: What do you draw inspiration from? A: My love for pottery started along the banks of the Georgia streams where I grew up. Rich red clay would turn into a child’s private art show left to dry in the summer sun. Some thirty-five years later I put my hands back into that mud, and today, childhood memories inspire a youthful joy hidden in every pot I make. I take great pride in focusing on the fine detail and finish work seen and felt in each of my pots. Each piece is wheel thrown or hand built, then carefully stamped, cut, pulled or altered to create a one of a kind piece of art to be held, used and enjoyed for years to come. Q: Is this your full time gig or a side hustle? A: My husband and I moved to Raleigh from Annapolis, MD in 2013. We raised two beautiful daughters together, I have enjoyed a long career as a dental hygienist, and for the last fifteen years, I have been pursuing my passion for ceramic art. Today, I enjoy working full time out of my home studio in Raleigh, NC. Q: Give me a 3 sentence elevator pitch about your business. A: Trades of Hope is a mission based Fair Trade fashion accessory & home décor company. As a Compassionate Entrepreneur with Trades of Hope, I seek to empower women out of poverty through marketing and selling our artisans’ beautiful, handcrafted products. You can also find me online at StyleSlowly.com, a blog devoted to helping women feel Empowered, Grateful & Fashionable through conscious consumerism. Q: Is this a full time gig or a side hustle? A: I feel very fortunate to be able to pursue my Compassionate Entrepreneur business with Trades of Hope full time. A: I’ve recently started a #StyleSlowlyGratitudeCollective, and invite those interested in our mission and Fair Trade products to join! Essentially, it is a way for us all to connect, practice mindfulness, and share our gratitude for our lovely purchases, as well as the joy & empowerment they bring to others. More information can be found on my website StyleSlowly.com.